Today Members of Occupy Homes MN dropped a banner outside GMAC Mortgage in Minneapolis MN, that banner, “Jacqueline Barber’s Blood Will Be On Your Hands, GMAC Don’t Evict”. 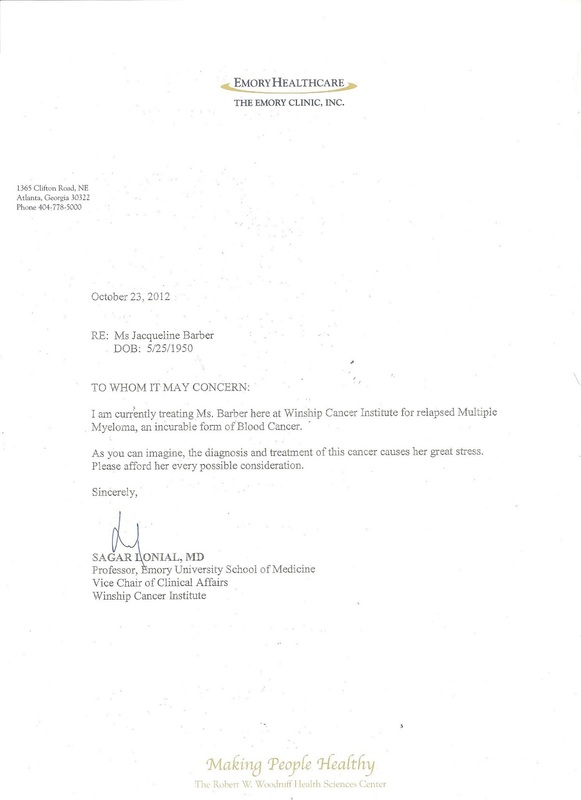 The group also meet with GMAC staff and delivered a doctor’s note(Image of note below) and demand that GMAC work with Jacqueline Barber. GMAC committed to contacting representatives with Occupy Our Homes Atlanta with 24 hours. Jacqueline has not only been fighting for her home, she’s been fighting for her life. 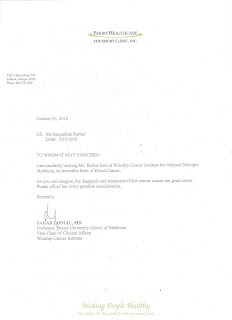 Jacqueline’s cancer came out of remission at the end of last year and she is now undergoing aggressive chemotherapy. More on Jacqueline’s story and her online petition. 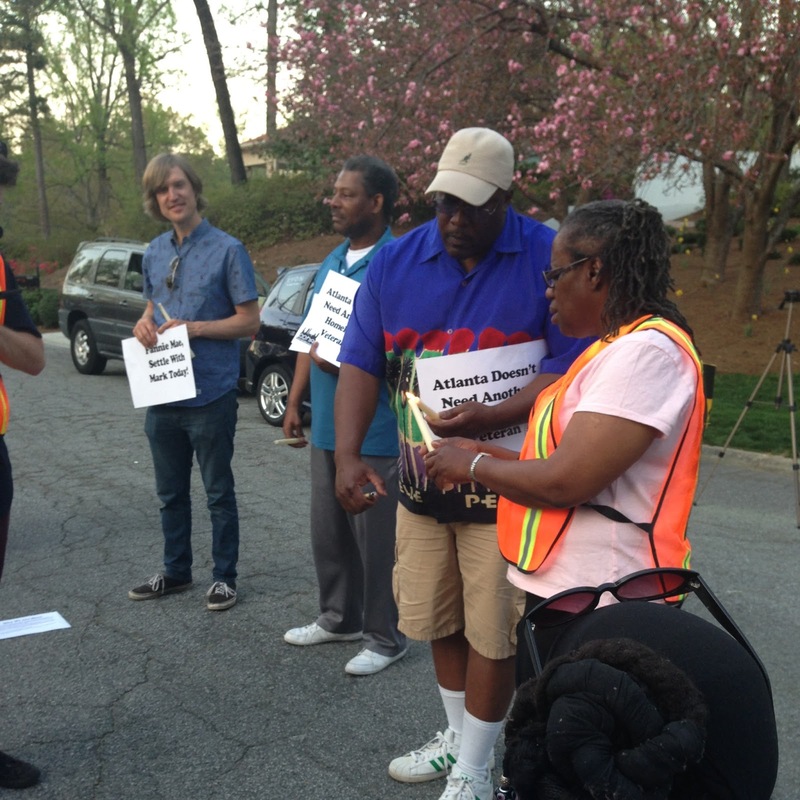 Just over a month ago Mildred Garrison Obi marched to the home she was evicted from in November of 2012 and moved back into it with the support of her neighbors, Occupy Our Homes Atlanta, National Action Network, and AFSC. Mildred has been in the home ever since. To celebrate Mildred's home liberation and to bring her community together Mildred hosted a cook out this weekend. 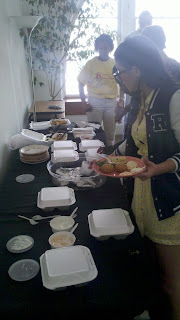 It was a social space where folks that have worked side by side to on Mildred's campaign could connect on a human level, learn more about each other, and enjoy delicious food. It was also a time where neighbors were invited to come learn more about why Mildred moved back in her home, and ask questions about the legalities of her actions and what next steps are for Mildred. The next steps are unclear. 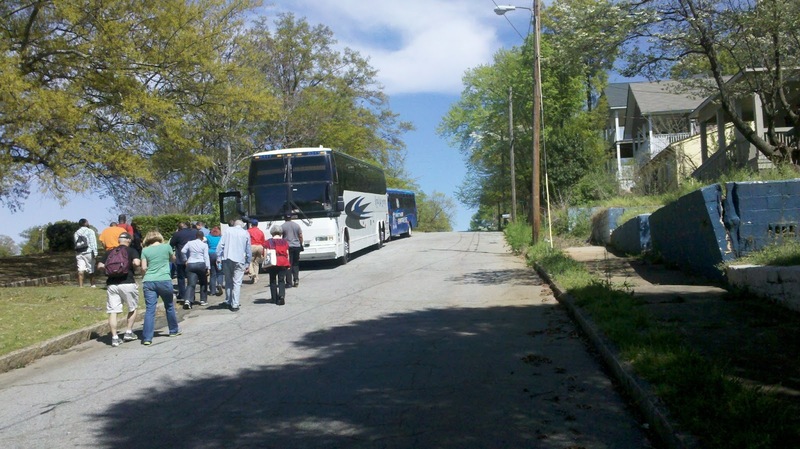 Bank of America had opened up a line of communication with Mildred, and had put several options on the table including donating the home to a non-profit that would then donate the house back to Mildred. After some time, Mildred decided to accept that offer. Not Bank of America has decided to take that offer off the table claiming that the title is in tranisition to HUD and the home donation would be to complicated. As of Friday Bank of America now says Mildred's only option is to be evicted a second time or accept a cash for keys offer. Mildred's goal has always been to stay in the place she'd called home, she has no intention of leaving. 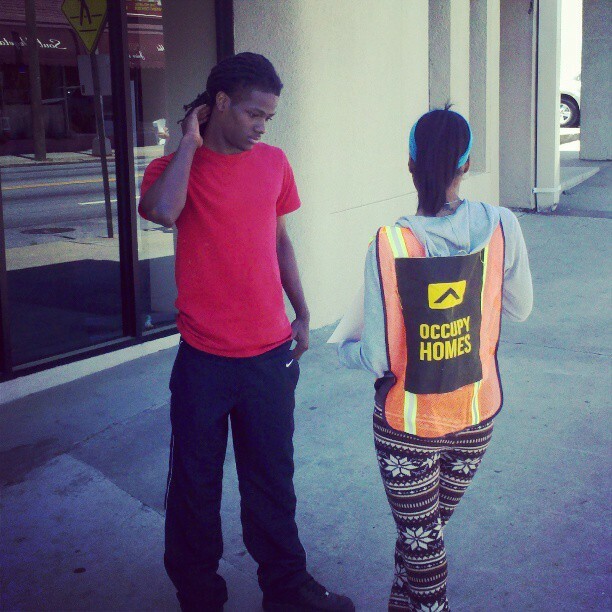 This Monday there's a call set up with Bank of America where a formal decision is to be made. We are asking that folks come to Mildred's home(1047 Park Gate Place, Stone Mountain) on Monday afternnon whenever you can. Spread the word far and wide. 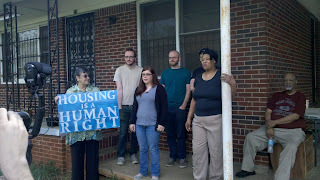 Today AFSC joined Occupy Our Homes Atlanta to help deliver a message to Jamie Dimon in solidarity with Occupy Homes MN and two families in Minneapolis fighting against Chase Bank. 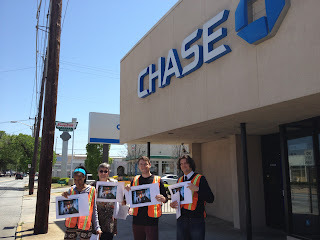 We showed up at the Chase bank branch in the Westend, walked into the branch and delivered hardship letters for Jaymie Kelly and Sergio Aguilar along with pictures of them both. 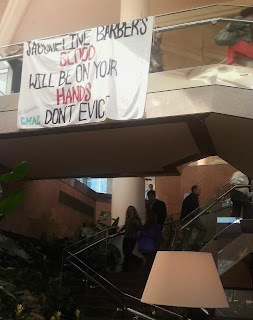 We made it clear that we would not accept their eviction and that we wanted the message sent to Chase that we need real solutions, not evictions. After delivering the letter we spent about an hour outside the bank asking Chase costumers to deliver hardship letters to Chase employees while they do their banking. 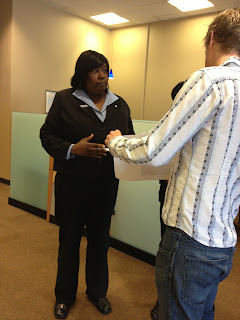 Dozens of Chase costumers agreed to ask Chase staff to work with Jaymie and Sergio. 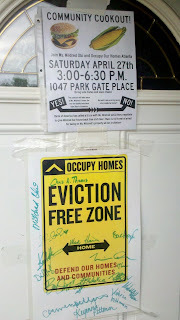 Occupy Homes MN has joined with residents in Minneapolis' Central and Powderhorn neighborhoods to declare an "Eviction Free Zone". 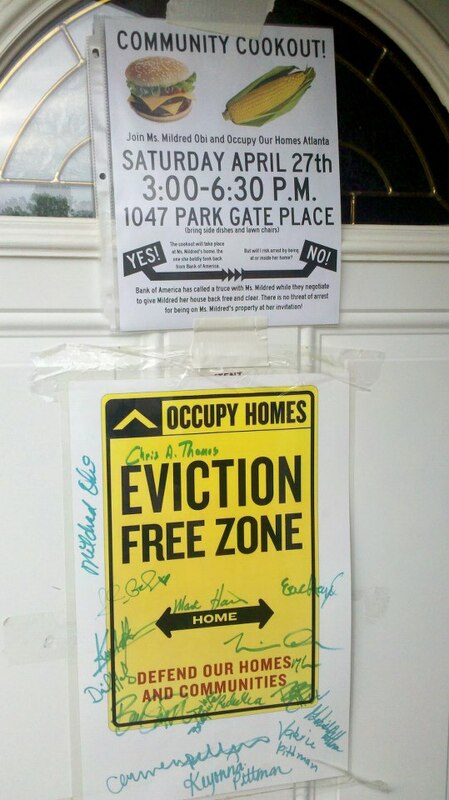 Three of the residents in the Eviction Free Zone are fighting against Chase Bank to stay in their homes. Jaymie Kelly has lived in her home for 30 years. After falling victim to a predatory loan, Chase expects Jaymie to pay $255,000 for a house currently valued at $81,000. After two attempts to meet with Chase and negotiate, the bank still refuses to discuss a responsible solution that will allow Jaymie and her daughter to stay in her home. 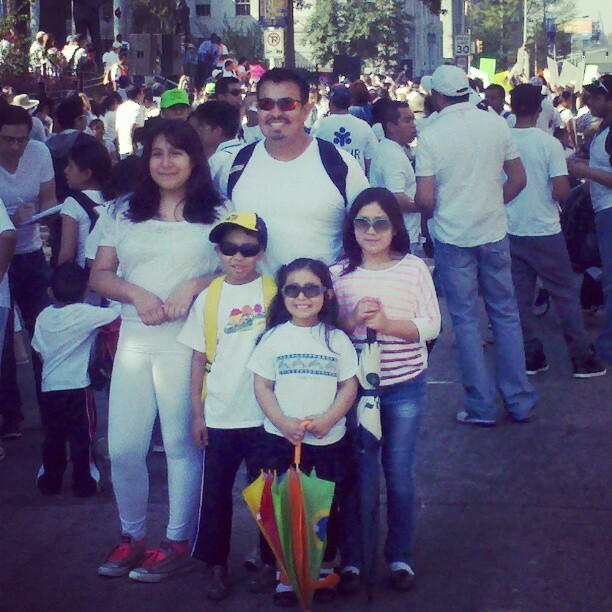 They are proceeding with the foreclosure process and Jaymie is facing eviction in just a few weeks. Jaymie refuses to leave her home, declaring her right to stay in the neighborhood where she has lived her entire life. 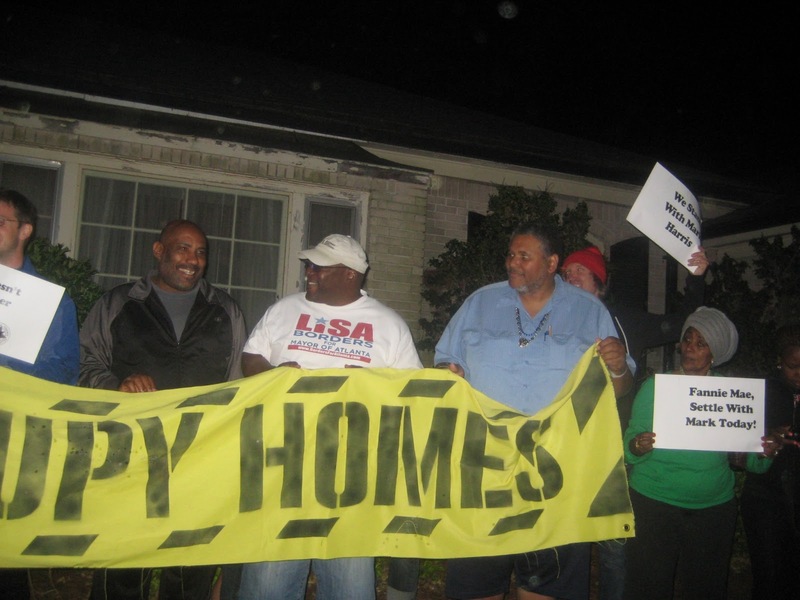 As the fight continues between retired US Postal worker, Jaymie Kelly and Chase Bank CEO, Jamie Dimon, other homeowners in the Eviction Free Zone join in the struggle for fair negotiations with Chase. After neighbors and supporters called Chase to demand the bank work with these homeowners, Sergio Aguilar received a call from the bank saying they would look into his case. But as his redemption period expired on 4/9, Chase informed him they would not work with his family and plan to move forward with an eviction despite the fact Sergio can afford payments based on the current value of the home. Georgia school workers, students and allies marched down MLK Jr. Dr. in downtown Atlanta to hold the Georgia Department of Labor accountable and to continue the fight for Justice for School Workers! American Friends Service Committee is excited about this recent victory and we look forward to continuing to explore ways to support this dynamic coalition! 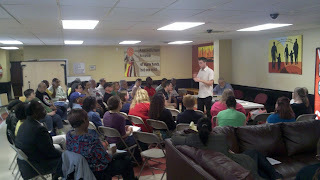 Amazing Video Recap Of Mark Harris Week Of Action! Check it out and share far and wide! 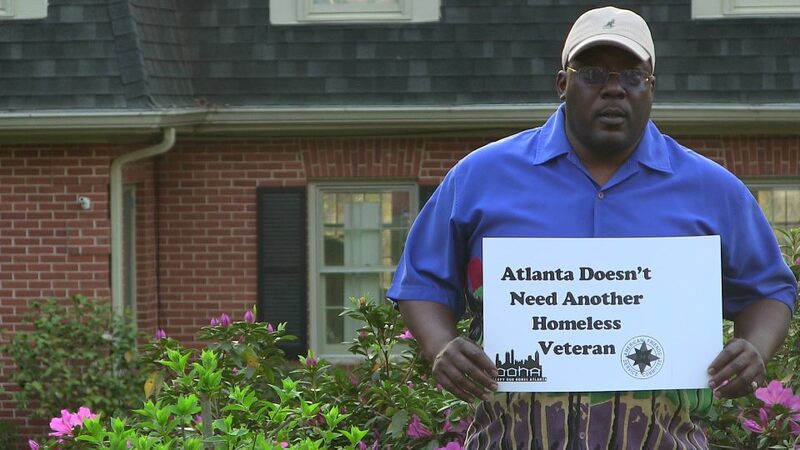 Special Thanks to Rob Call with Occupy Our Homes Atlanta for making this short, and of course everyone who participated in all of the actions this week! Sign the petition to keep Mark in his home! 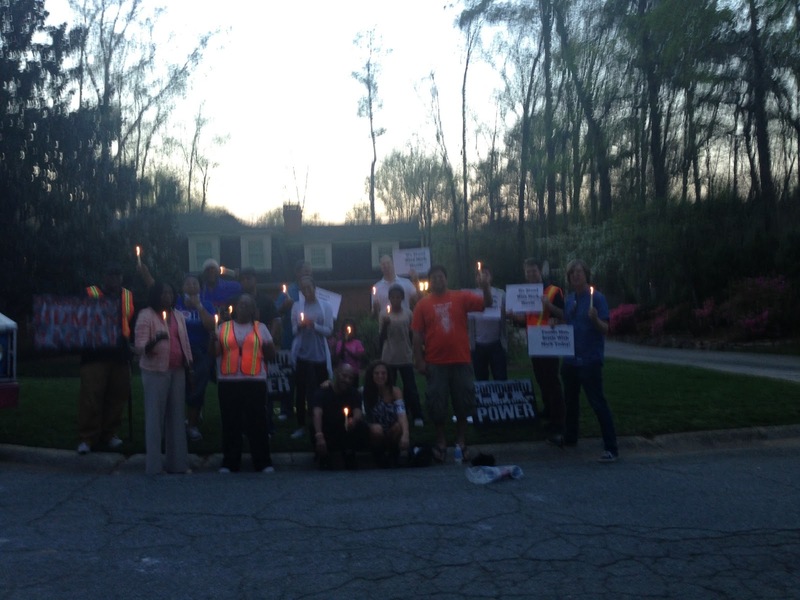 For a very long time, organized hostile forces in business and government have abused the predominantly black neighborhoods near Atlanta's business and convention core. These neighborhoods have endured the construction of four stadiums requiring 12,000 or more parking spaces each; expressway construction; meager support for community development; punitive or nonexistent social welfare programs; a public housing subsidy system that strongly favors wealthy homeowners over everyone else; and other damaging assaults. But neighborhoods are now marshaling their own resources and fighting back. Joined by neighborhood residents we explored some of these battles Today as part of the "Taking Back Our Neighborhoods Bus Tour." 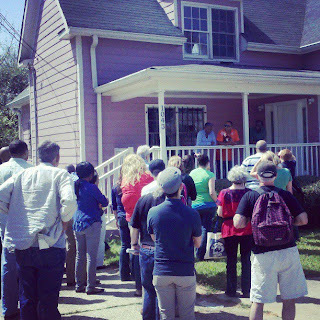 The tour, organized by Atlanta Democratic Socialists of America and Occupy Our Homes Atlanta started in Peeples Town with brief talks about current and past struggles by residents in Pittsburgh, Peeples Town, English Avenue, and Vine city. 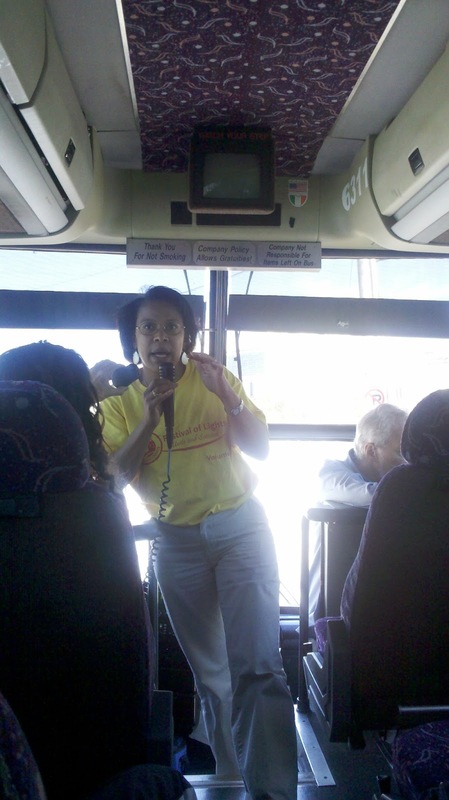 The tour then became mobile, taking time in each community to create space for residents to tell their story's of struggle, victories, and shortcomings. One highlight was the stop at 1043 Windsor street, where home liberator's Reneka Wheeler and Michelene Meusa pretty mush reenacted their home liberation press conference on the actual porch of the home liberated in an act of civil disobedience December 6th of last year. Joining them on the porch was long time Pittsburgh organizer and former State Rep Douglas Dean, who spoke of the importance of bold community action that push the boundary's of unjust policy, perhaps even crossing those lines when it makes sense to do so. After the tour we reconvened at the American Friends Service Committee's downtown office for a delicious dinner and more discussion, which seemed very focused on the new stadium, which seems to be just about a done deal....or is it? 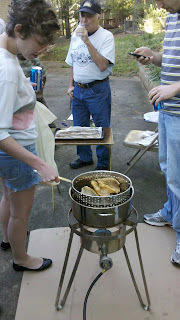 This past Friday night dozens of community members joined Mark Harris and his family for an eviction free fish fry. The purpose was two fold. We certainly aimed to have a good time enjoying each others company, making new friends, and eating delicious food on a perfect night, but that was not all. Under all the cheerful vibes there was a serious earnestness to our gathering; we were there to make a plan to defend Marks home from Fannie Mae and local law enforcement. 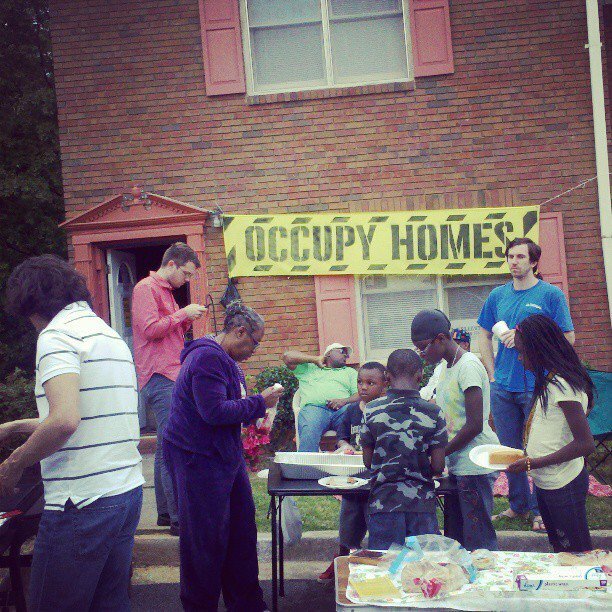 On a full stomach we ran several drills preparing folks for an all out nonviolent eviction defense. 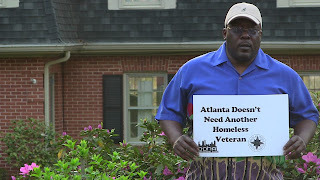 Our goal is to fill Marks yard with people, should the time come, and make it clear to Fannie Mae that Mark's community will not accept another vacant house, we will not accept another homeless veteran in Atlanta. As Mark would say, "We're fired up, can't take it no more." Mark also started an online fundraising campaign in case the worst happens. Over the last few months one of the residents we’ve been working with, Mike Figaro, seems to be a victim of fraud ( more on their story ). Mike set up a meeting with district 7 Fulton County Commissioner William “Bill” Edwards. He set the meeting up and made it clear that he would have guests. Mike had asked if I could join him, as I’ve been one of his main advocates. Mike also asked Rob Call, with Occupy Our Homes Atlanta, a close personal friend, and two members of the local clergy to be in the meeting as well. The meeting was to be fact finding for us, not contentious. When we were called back to the office I immediately noticed a shocked look by Edward’s chief of staff Deloris Baskin face when she saw me. I’ve never met Deloris in my life. 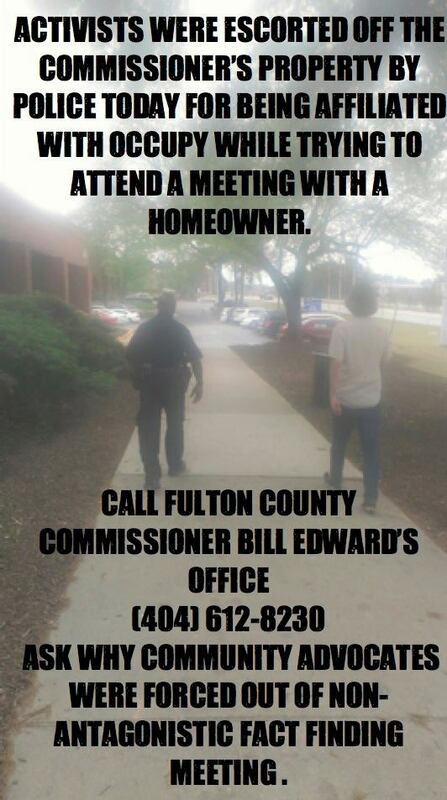 When we got in the lobby of the Fulton County Services Center, Where Commissioner Edward’s off is, there was a team of about five cops waiting for us. They informed us that we were not welcomed in the building, and that we would be arrested for obstruction if we didn’t leave. 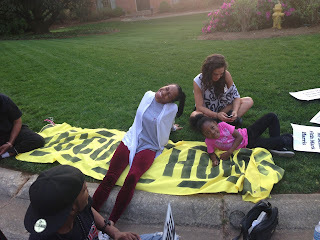 We walked outside and police followed us, letting us know that we were not welcomed outside the building and that we would need to be escorted to the property line. Since the incident a lot of people have called into Edward’s office demanding an explanation. Most callers have been ignored; a few have been told that Rob and I were not on some list. The fact is, there was no list. Mike had made it clear that he would have guests, and even if he didn’t it’s rather bizarre that Rob and I would be treated as criminals while other guests were welcomed without question. 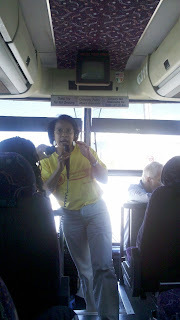 It seems clear to me that Edward’s chief of staff Deloris Baskin recognized my face from something Occupy Atlanta related and decided that there was a threat. The ironic thing here is that we were there to deal with a real threat; the Figaro family losing their home as a result of a fraud committed in their contractor’s permits applications. There was a silver lining to all this. After Rob and I got kicked out hundreds of people around the country started calling into Edward’s office. The Figaro’s told us that they believed their meeting was taken very seriously after the phone lines were effectively shut down. Edward’s office has agreed to open a fraud investigation around the Figaro’s case, and they admitted to documents looking forged. What happened to Rob and I was not only unacceptable, it’s actually quite illegal. I don’t believe we can afford to allow elected officials or their staff to make up laws on the spot and abuse their perceived power on a whim. While I’m not sure what AFSC’s response or my personal response will be to Commissioner Edward’s staff behavior, I am sure that there will be a response. In the meantime I really appreciate all the calls people have made on our account. 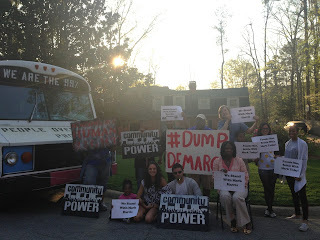 If nothing else It really helped the Figaro’s and perhaps it Edward’s office will think twice about being loose with basic civil rights of Fulton County residents, which Rob and I are both. 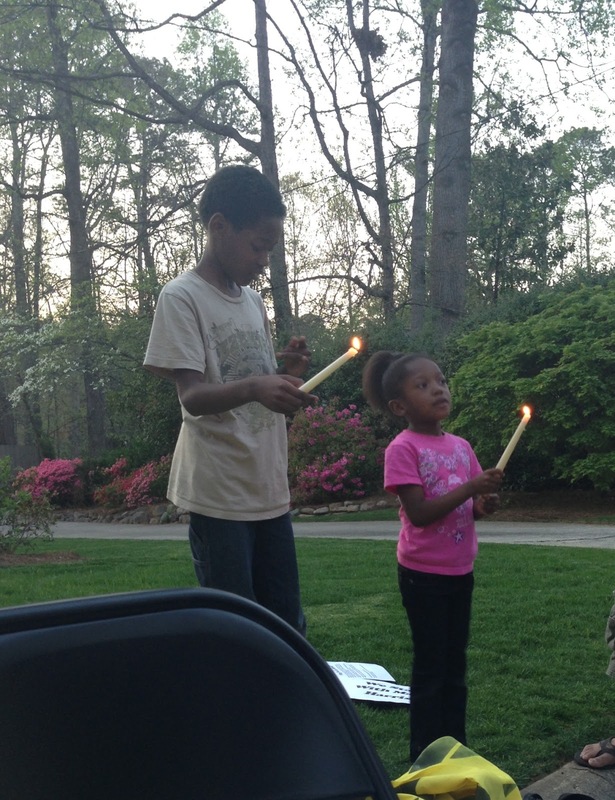 The Past Wednesday Desert Storm veteran Mark Harris held a Candle light vigil and prayer service at the home of Catherine "Candy" Lasher, the regional director of Fannie Mae. 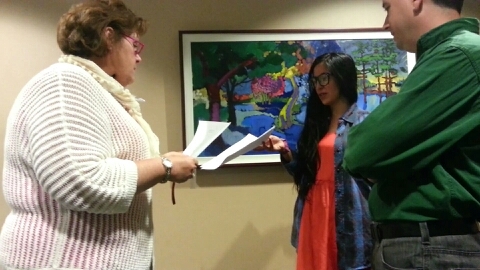 Candy can decide whether or not to throw Mark Harris out of his home. Around twenty people Joined Mark for the somber event. 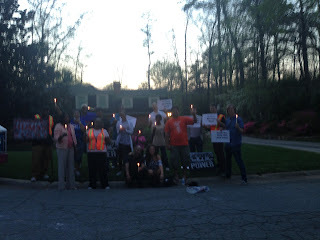 After canvassing Candy Lasher's neighborhood to make sure everyone knew why we were there and that there was no need for folks to be afraid, Pastor David Rice led the group in prayer not only for Mark Harris but the millions of people struggling with a housing issue. We had a candlelighting ceremony in which everyone in attendance shared their hopes, dreams, and concerns. For me personally the issue of national security was on my mind this evening. I belief in national security, I think It should be our top priority as a national community. A nation that is truly secure would see all of it's residents with a place to call home, food to eat, and a decent paying job. The sad irony in that we have all the resources to make the dream a reality. Our economic crisis has never been about resources, there's is and always has been enough to go around. Our crisis is about economic priority. If we continue to believe that developing enough weapons to bomb the world a dozen times over and recruiting young people to go bomb other poor countries somehow makes us more secure, then we will continue to live in economic insecurity while those that profit from our manufactured fears make record profits. 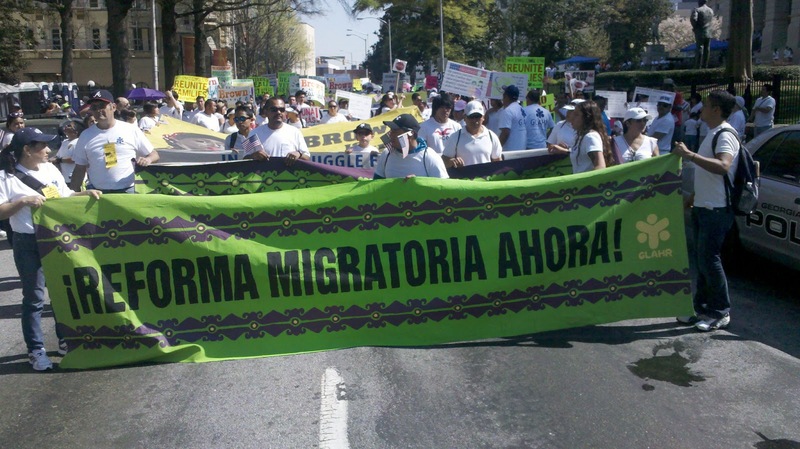 Mark Harris and millions of others are in crisis, and we need to start seeing corporate greed and a historic military budget for what they are; robberies from our communities and real threats to real human security. One simply place to start prioritizing national security is for President Obama to do what he has said he would do on the election trail and fire FHFA director Ed Demarco. 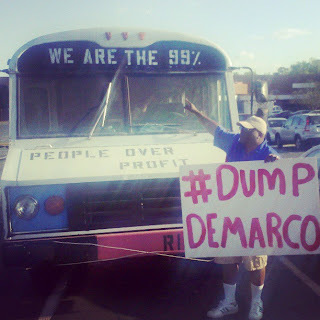 Demarco could single handidly bring relief in the form of the greatest people's bailout in my generation with mortgage principle reduction. 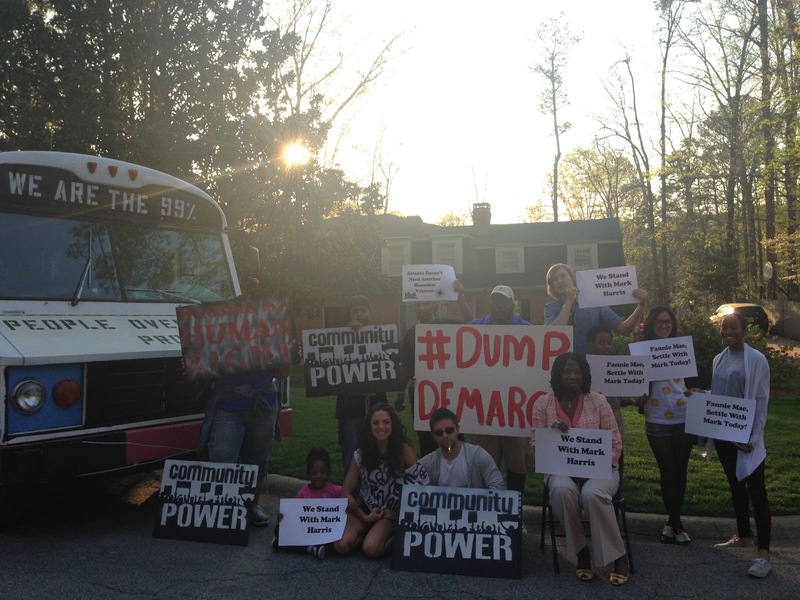 Demarco has widespread support for this measure but has refused to move forward claiming that it's would be morally wrong to relieve people like Mark Harris of their dept. It's time to let go backwards thinkers like Ed Demarco and appoint someone who has the courage and compassion to take our communities out of the hostage situation they've been in for years. Today a crowd that swelled to thousands marched around the Georgia capitol for immigration reform. 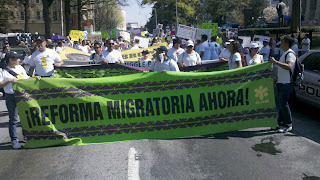 The march was primarily organized by Georgia Latino Alliance for Human Rights (GLARH) and was endorsed by dozens of groups including AFSC. 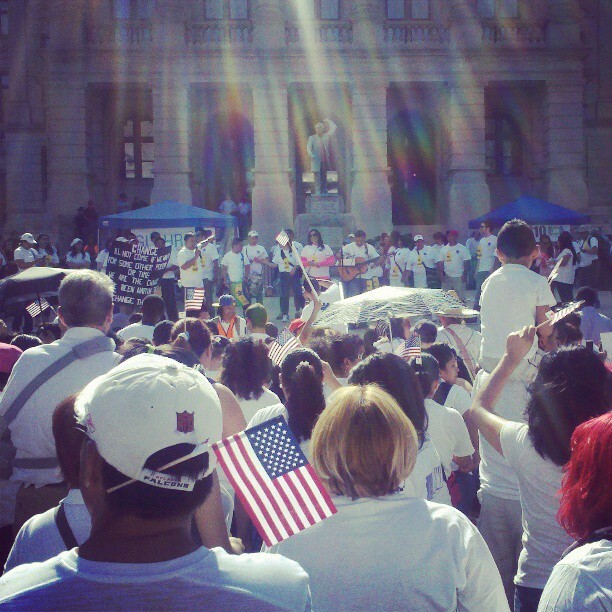 Today's turnout demonstrated people's commitment to human rights and equality. The crowd was filled with everyday people, families, folks you know had to plan in order to take a day off of work to hit the streets. "For years, we've been targeted by 287(g) and its gotten worse with S-Comm, HB87, and the student ban. 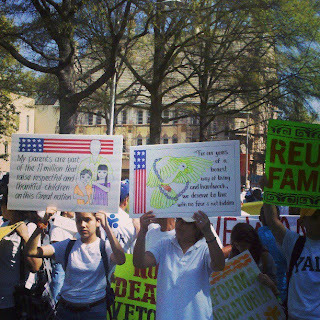 Now we'll be marching to tell the Governor(Nathan Deal) to veto SB160 that would make passports no longer valid as an ID in Georgia. "Ni uno más. Not one More." 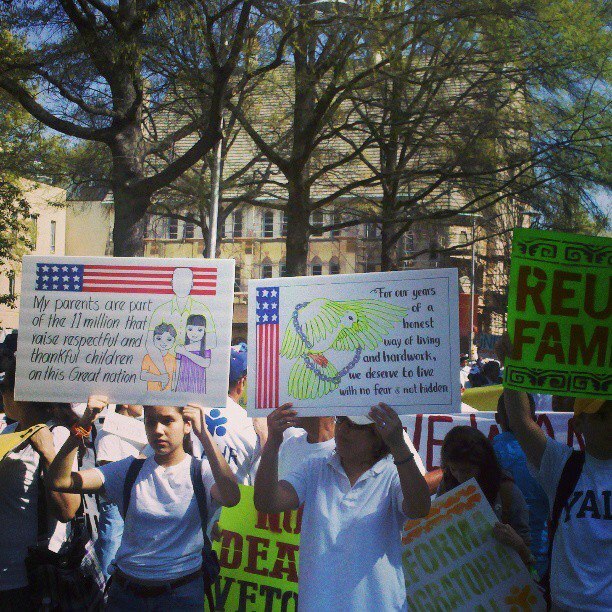 Not one more deportation and not one more day without political equality." Stated Adelina Nicholls with GLARH. 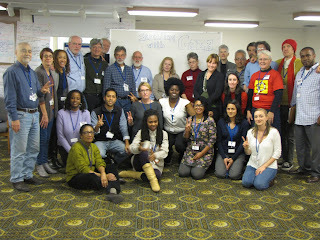 AFSC is excited about the turnout today and will continue to explore ways to support the movement. Please join us in holding Michael's family in the Light. On a personal note, Michael was a source of inspiration for me. I'll never forget a presentation Michael gave on the War on terror and the human costs abroad and right here in our communities. That one talk changed the lens through which I see local consequences to war and my organizing focus and approach in Atlanta. If I could say something to Michael right now I'd say, "The far and wide impact you've left in your wake in not measurable. Thank you for helping me be a better organizer Michael. You are loved and will be missed by many." 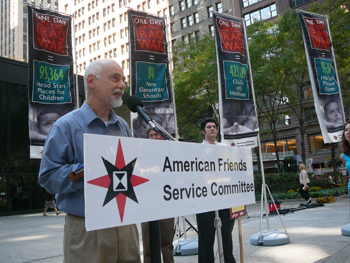 Michael McConnell, longtime regional director of AFSC's programs in the Midwest, passed away on Sunday, April 7, after a long struggle with cancer. The visitation is Thursday, April 11, from 4 to 9 p.m. at John E. Maloney Funeral Home, 1359 W. Devon Ave. in Chicago. The memorial service is Friday, April 12, at 4 p.m., at Wellington Avenue United Church of Christ, 619 W. Wellington Ave.
Michael became Regional Director for AFSC's Great Lakes Region in January 1990, and in June 2012 for the new Midwest region. Michael became a passionate and creative leader in AFSC and with many partners for building our programs to challenge war and preparations for war, while lifting up alternatives. He was one of our chief thinkers and strategists for work on ending war and violent response to conflict, from developing the “Eyes Wide Open” campaign to our current F-35 campaign on military spending. He supported creative and effective programs dealing with healing justice, immigrant rights, peace, and economic justice across the region and the whole of AFSC, nurturing leadership qualities among staff and championing opportunities for young people to engage in AFSC work and gain knowledge, skills and passion for peace with justice. Michael’s legacy is deep and enduring. 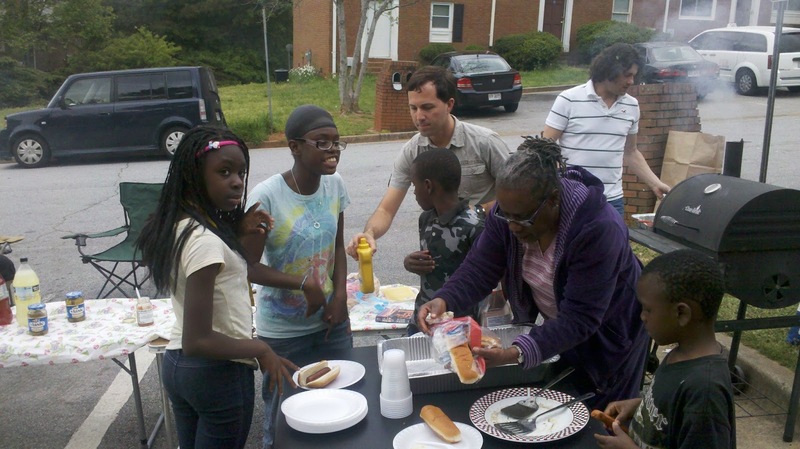 Around 8:30 AM on Friday August 5th 2012 Sherrye Calhoun woke to Dekalb County Sheriff’s Deputies knocking on her door. They demanded that she leave her home immediately. Over the course of the morning Sheriff Thomas Brown’s deputies supervised her eviction. They had no dispossessory warrant or writ of possession filed with the court. She has lived in the home for 30 years. Within hours, Ms. Calhoun’s possessions were moved back into her house with the help of Edgewood residents and supporters. Sherrye Calhoun decided that she wouldn't leave her home regardless of the risk. 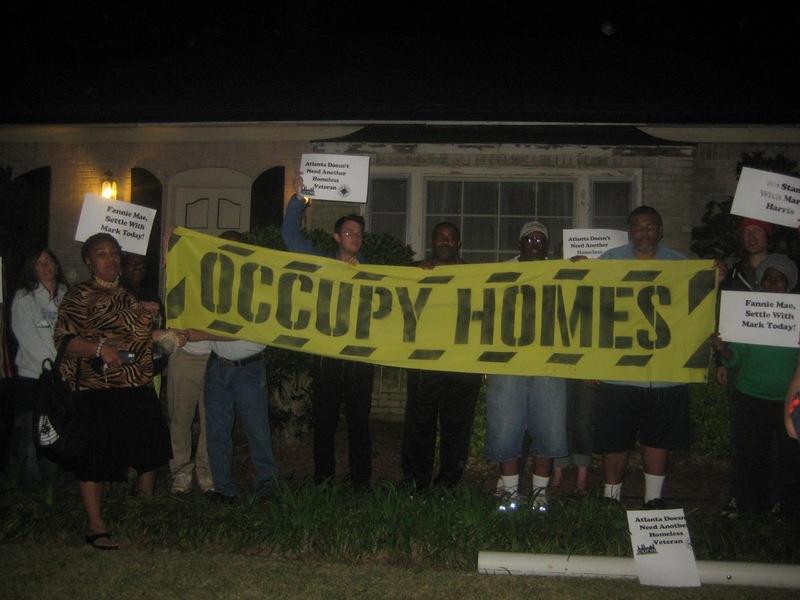 With a growing homeless population all over the country, and millions of "zombie foreclosures" the idea of folks building community support and simply marching to a vacant home that was once theirs, pulling the boards off and moving in publicly seems in the realm of possibility. 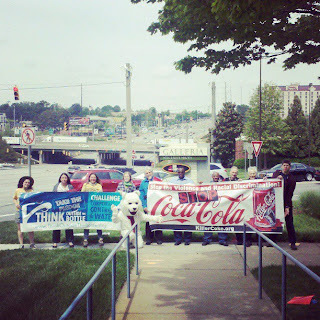 If bold actions were taken in communities all over the country banks would be overwhelmed. What we need now is to match the banks unprecedented greed and corruption with historic creative people power.